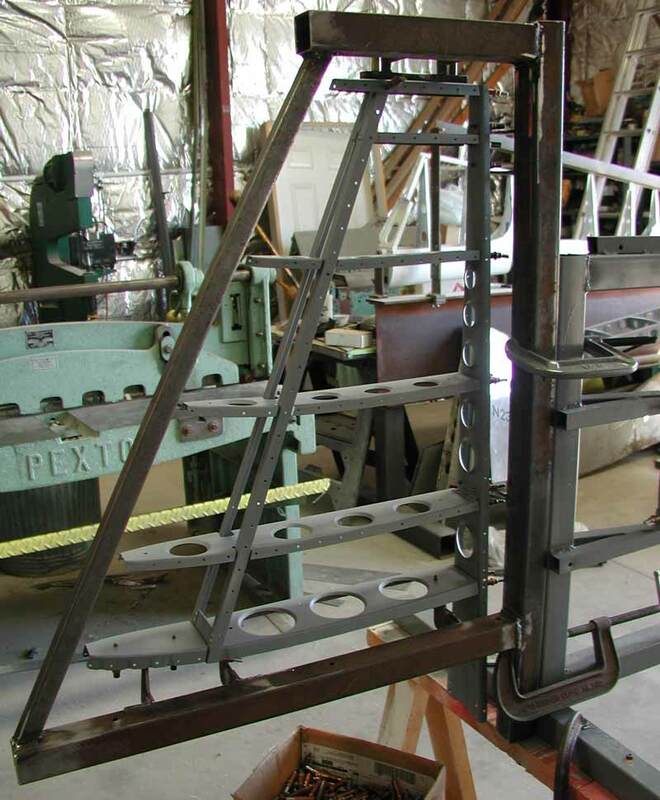 The Aeroplane Factory has manufactured a special steel fixture that we use when rebuilding a Globe Swift vertical stabilizer. The rebuilding process is started by drilling out all the rivets in the assembly and removing the outer skins. An intitial inspection of the component parts is conducted and unairworthy parts are noted and discarded. The remaining parts are then cleaned of dirt and surface corrosion using glass bead blasting. After cleaning a second inspection of the components is accomplished and the final list of acceptable parts is completed. When a full complement of horizontal stabilizer parts is available, either by cleaning the old parts or manufacturing replacement parts, they are painted with an epoxy-based primer in preparation for reassembly. 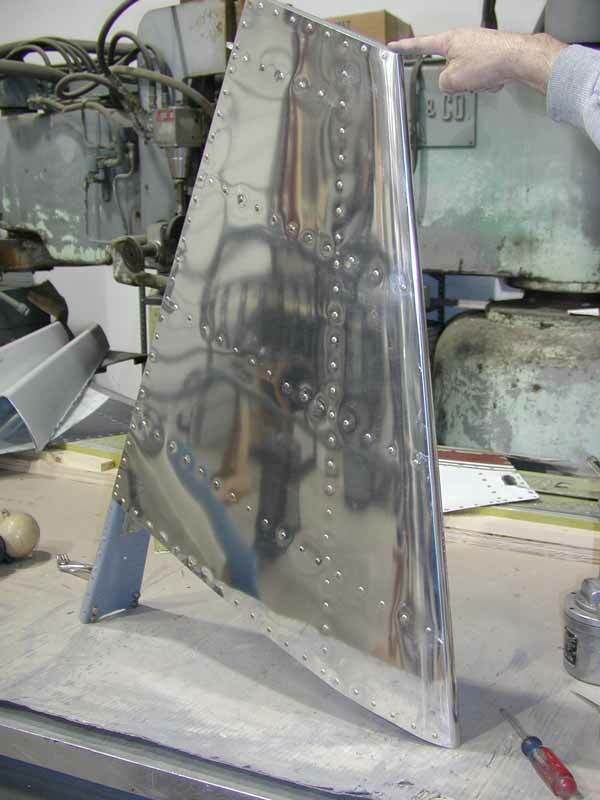 The outer skins of the vertical stabilizer are generally replaced, since forming new skins is more time-efficient than trying to clean and prepare old aircraft skins. 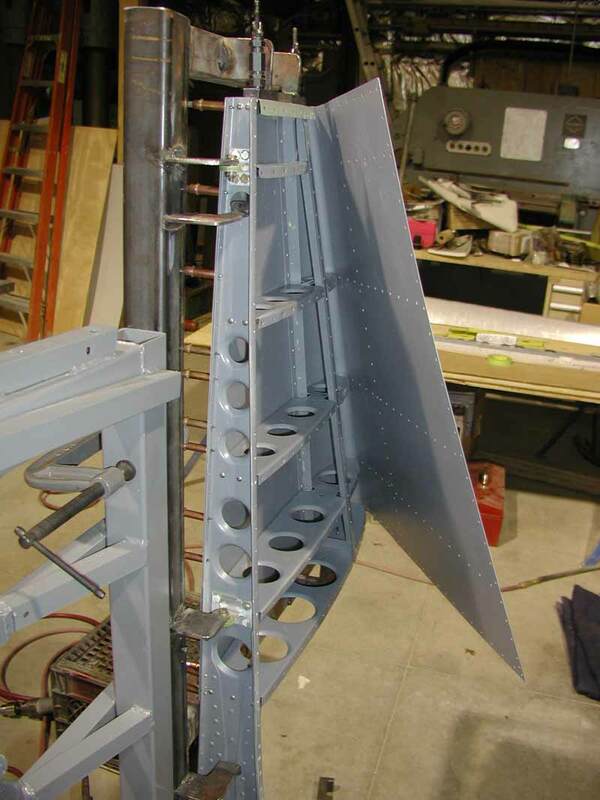 The vertical stabilizer leading edges are formed using a Farnham Contour Roll and a Press Brake with a special tapered die used to produce the correct leading edge radius. The vertical stabilizer structure is placed into our assembly fixture and where the new skins are fitted to the structural skeleton. When the final fit has been established, the skins are removed and their inside surfaces are painted with epoxy-based primer prior to final assembly.